Living in a capitalist country, people come up with many ways to earn a few bucks but I understand making (earning) a few bucks to be conversely different from fundraising, wouldn't you? 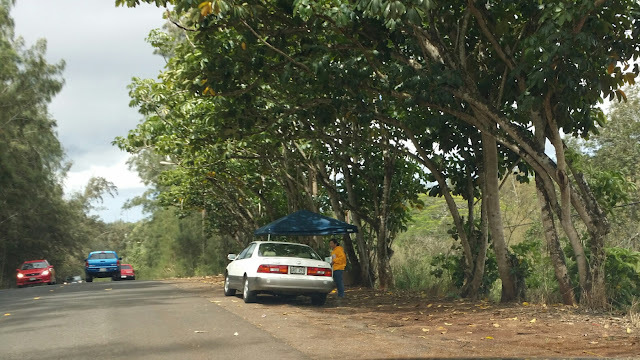 While driving to da grave on Memorial Day morning in Waipio, we passed by a couple I've seen before (90% surah) in Salt Lake and couldn't help but notice they were setting up a familiar 'shop' on da road side. I commented to Da Wife, "no way.... not hea" and she was wondering wat? Dis "couple" does da same thing - sells Krispy Kreme's - on a small triangular median strip on Salt Lake Blvd & Radford Dr and if you driven by, you know wat I'm talking about. 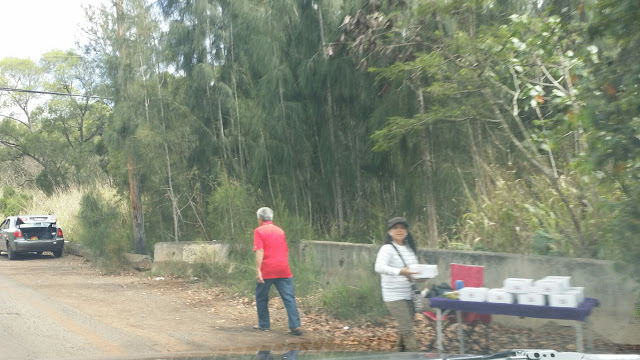 Wat's wrong wit selling goods on da side of da road? If da C&C nor HPD hasn't gotten involved, well, I guess nothing but wen you do it undah da guise of "fundraising", there's wea you got some moral issues going on.... especially wen da Krispy Kreme box clearly says "FUNDRAISING" and you can safely guesstimate dat there isn't a team or group event involved. We've done da Krispy Kreme fundraising doughnut thing but we had da players there in uniform and we definitely didn't do it every single week. It makes you weary trying to weed out whether to support a possibly legitimate fundraising unless they're selling Zippy's fundraising tickets wea da supporting organization is clearly on da ticket. You would think Krispy Kreme would catch da hint as well since you have to fill out a form noting da organization name and purpose but I guess those could be made up. It must be becoming a successful monopoly as dis 'fundraiser' was only about a quarter mile down da road. And seriously, have you evah heard of/seen a "fundraiser" on da only road to da cemetery and nevah had a questionable tinkle of inappropriateness? Would you evah consider pulling ovah on da unpaved dirt shoulder of a two lane road to buy unsealed boxes of doughnuts? But then again, da road is shared with Waiawa Correctional so maybe they were thinking of omiyage for da prisoners or snacks for da correction workahs? Is there such a thing as "permanent fundraising"? I have a friend who's infamous for "permanent borrowing" but at least we know wea our stuff is going. Just out and about today and realized dat no mattah what time of day, there's always a line..... at Starbucks. Das one place dat there really is no socio-economic class although you really would think there would be one considering you dropping plate lunch+ kine money for a single drink! It's amazing how you spot a family of four leaving da 'cafe' with nearly $30 worth of "drinks" thinking wat could you buy with $30? Wat is da draw, da lure, da niche? It isn't even an age thing either as we've all seen pre-teens - and younger - toting around da unmistakable clear cup sprouting a green fosfluorescence straw with da clearly identifiable logo. Are they doing wat Coca-Cola did wen it first came out and have an 'addictive' ingredient in their formula? Ok, gotta go. They just called Da Wife's name and her coffee is ready. Yeah, i was writing dis as we were waiting. Once in awhile we get someone who happens to finish checking out da current news posted on The Honolulu Star-Advertiser website and whether curiosity - or boredom - consumes them, decides to scroll all da way doooooooowwwwwwwwn da page and notices an itty-bitty fill in da blank space section titled "Star-Advertiser Blogs". Chances are dat they are just browsing through clicking watevah links are clickable and briefly scan da screen to see if anything interests them. Then once in a great while we get someone, who has no idea wat da 'blog' - nor da author - is all about, and shares a distinctively differing 'comment'. WWD: "I'm thinking maybe these 12 aren't higher education bound and advocates for higher minimum wages." A bigoted statement? Perhaps, but not an unwarranted one. Are you telling me da vast majority of people who graffiti have been accepted to da likes of Standford, U-Dub, or UCLA? 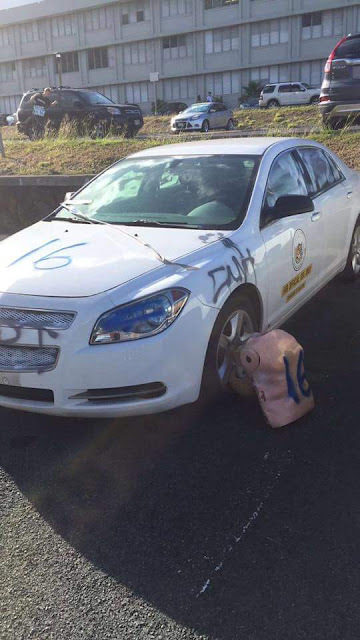 Are you telling me those who vandalize are aspiring future law students? All "opinions" are based on actions, with AND without proof. Am I a bigot? By definition, no but I am passionate about my views and unafraid to share them. My views and opionions are NOT absolute though which would disqualify me as a bigot. When presented convincing valid points, my views have been persuaded as those with open minds are able to. Are you a bigot if you believe - proof or not - dat higher education bound people are less likely to act 'illegally' than those who are not college bound? KIMO/JAMES: There are many of those who are forced to work a "minimum wage" job to supplement an under salaried position, just to provide their families the basic needs. Understood because I've been there, done dat - in fact I'm still doing it but you failed to understand da premise of "advocates for higher minimum wages". It was aimed towards those who are ONLY working a minimum wage position full or part-time and considering dat a 'career'. Since wen was flipping burgers or stocking shelves - without advancement AND at minimum wage - considered a lifetime goal for da majority of 'educated' people? And those who pick up a "minimum wage job to supplement an under salaried position" are not considering a career move because as you have said it, they are already earning a "salary" which I can only assume is a salary, not hourly. If you cannot distinguish between the two, then dis entire paragraph is moot. Having to guesstimate dat you don't know da author of WWD!, I'm nearly da poster boy of dat statement. Right out of high school I worked three jobs (one full-time, two part-time), volunteered coaching youth baseball, volunteered as alumni marching band staff (drum majors) and going to school full-time (well, full-time classes, part-time attendance 😳 ). Nevah once did I count on "minimum wage" as a future. Yes, it is to supplement but I understood it as.... MINIMUM WAGE - definitely not a career move knowing it was 'entry level'. As of dis writing, I still work three jobs (salaried 50+ hrs/wk and two part-time), coach youth baseball and picked up anoddah full-time gig, being a father. KIMO/JAMES: Additionally, the actions of these 12 individuals is not a measurement of their academic abilities or their individual intellectual capacities, nor their ability to achieve in a higher educational program. Totally agreed but their "current" actions did not dictate that and das da only thing being pointed out. Even DUI and murder charges are brought upon full force BEFORE 'knowing' da individual which will impact their final charge and sentence. Their actions will bear harsh criticism but it is nothing to defend. It's almost like getting lickin's. If you know you messed up, you take it. You nevah lip back. Da problem these days is dat EVERYBODY lips back as if to justify dat it was 'almost' right - or ok - to have done wat was wrong. KIMO/JAMES: These students made some very bad choices and need to make restitution for their actions--for ALL CONCERNED. However, their mistakes do not necessarily dictate the outcome of their future lives. In fact, their mistakes, and the lessons they learn from these mistakes, may serve to make them better persons and perhaps even an example to many others--in the future. ABSOLUTELY! but in da mean time, you dished da damage, prepare to reap it's ugly head. Do we have to hang 'em? Heck no but they should be fully aware dat dis goes beyond just 'them' affecting all Moanaluans. Furthermore dis is fresh, not like it happened a year ago. Btw, I heard from a reliable source dat while they were unable to walk (participate in da graduation ceremony), they were still able to participate in da time honored Hawai'i tradition of receiving lei on da field! If das true...... Wassup Wit Dat!! As you stated, yes, da biggest hope we all have for them is dat they learn from dis horrendous mistake and strive on making bettah choices. Making "restitution" is not enough, if only monetary, as da message is basically saying if you can pay for it, then you can clean your hands and be done. Perhaps your advocacy of a higher minimum wage would aid in restitution as I can't imagine da bill being cheap. I nevah said it was crime nor did I insinuate it. My statement stated a (general) logical deduction dat those who act dis way wouldn't be career minded and more minimum wage based which is totally for anoddah discussion. Da debate will tirelessly nevah end but have you thought of da repercussions of raising da minimum wage? Wat about those who are making $10-15 /hr now and if da minimum wage increases to say dat amount like on da mainland - do those who currently were making more than minimum but now will be making da same as da "new" minimum wage get an increase as well? Who ends up paying for dat increase? I'm not an economist but if all da prices 'increase' as well, you still in da same boat but EVERYTHING just costs more and da consumer bites da bullet! And let me just flat out say dat there's nothing wrong with minimum wage workahs as many of them are 'stuck' but let me remind you I've been there, done dat so it's up to da individual dat if you want more, it's up to you. Your comment, basically, implies don't judge them on a 'single' action is understandable but this was an extremely bad 'decision' and they have to live with da fallout - don't make it them feel like "just pay da 'fine' and it'll be ok". Wat kine of message is dat? Did you see da destruction in full? Toilet paper can be removed but did you see da grafitti on SEVERAL buildings, da damage to da vehicle, ripping a water fountain from da wall - reallly? And das just wat was publicized. 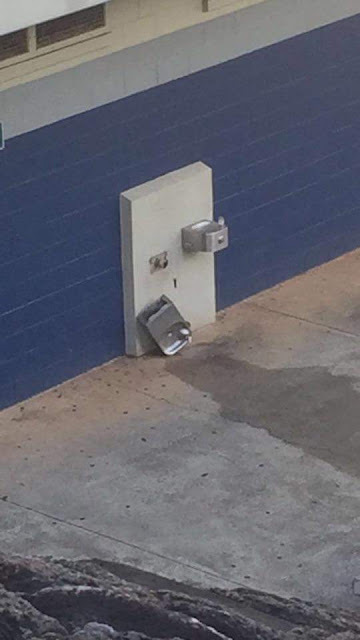 Da damage goes beyond just one wall. It was premeditated, calculated and not performed on just on a 'whim'. 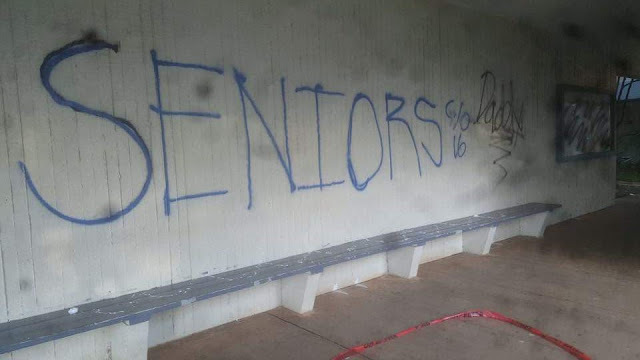 In fact if you look at one of da pics, they ran out of black spray paint and continued in blue showing they were prepared to do a lot of damage. It wasn't just isolated to one area either - it was across da ENTIRE campus! There's a less circulated pic in which they even spray painted across a brass art mural dat was built into da library from before when I was attending. Let me ask you dis then, would you feel da same if someone vandalized your home and property as a prank and they were kids? Do you say, "ok, just pay for da clean up and we're all good."? Now I challenge you, go ask any student attending - and alumni - of any school if dis 'prank' was "ok" - minimum wage or not, I can assume da answer would be no. We've been brought up to finish wat you start - well, at least most of us. It's an action dat you try to instill into generation aftah generation dat unless you are committed to complete watevah task is at hand, don't start 'em then. It's mostly prevalent in youth sports as we try to "teach them a lesson". I've seen many kids come through the program not 'wanting' to play but once they realize dat they are having fun, learning and gaining life experiences, they're wanting to come back the next season. I've shared countless examples with da players like, "why would you sprint 137' knowing dat you only got 3' left to score... and then jog the remaining 3'?" You already sprinted 137, was it that much exasperating to run da remaining 3'? Think about cooking. Would you prep a 30 ingredient meal with a dozen pans and dishes taking you two hours to prepare..... only to leave it on da stove or in da oven? Would you put on shoes to go on a run and not tie up your laces? Would you go shopping and leave your wallet at home? Wait, now dat might be something you'd want to do. See anything wrong with dis? 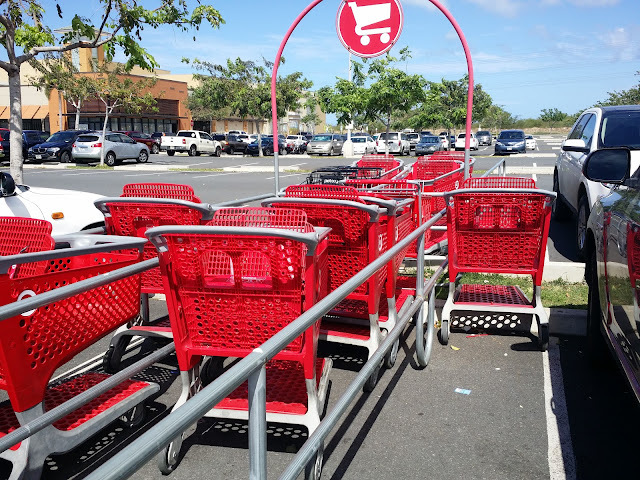 How can you, in pic 1, miss da entire cart return area? Seriously, you were able to push da cart all da way down but didn't want to put it in da actual cart return? Ai-goo. In pic 2, I actually witnessed dis one. A 55-65 year old Japanee/Filipino looking man was returning his cart and refused to push it three more feet into da cart return. I had to do a double take and chuckled a little. Seriously, da front of da cart was inside already but he couldn't either walk it fully in or give it a small push to roll it in?? He just walked away as if nothing. C'mon, have you evah done dat? Well, maybe not da cart thing but started something and nevah finished? We live in da real world and we all have been there, done dat. Whether there may have been some reason or justification for not finishing, let's hope (work for) finishing it especially if you're just three feet away. 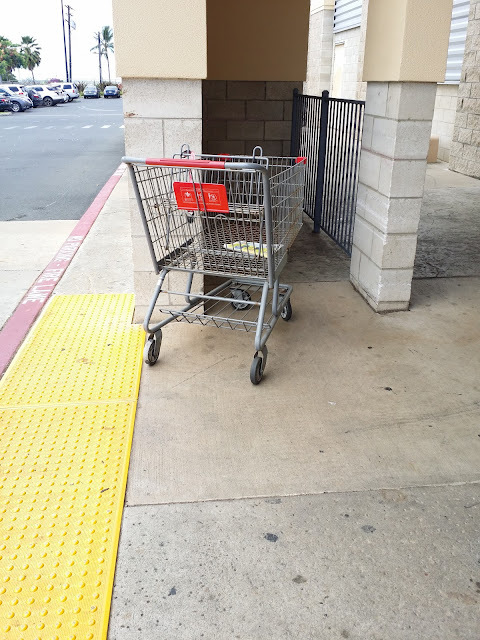 Or at least have enough strength to push da cart through. I just couldn't believe it wen I heard and read about it on social media and da news. My heart sank, anger enveloped and I was just..... extremely disappointed, well, mostly sick. 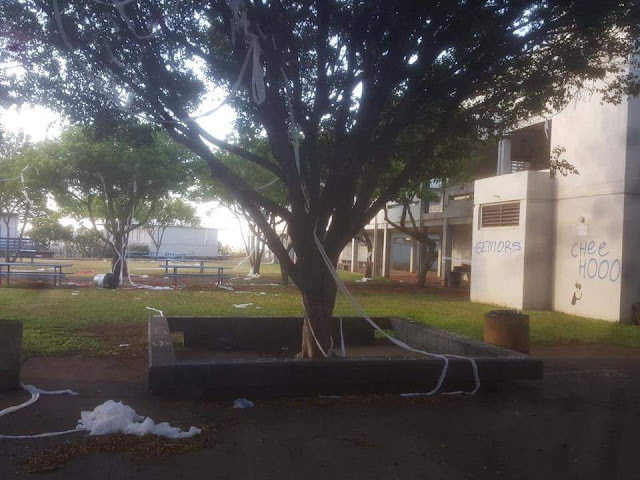 Just a few days before graduation ceremonies were to commence, a dozen soon to be graduating seniors from da Moanalua High School Class of 2016 decided that they wanted leave a mark (pun fully intended). Wat these lolo's had done was unfathomably incomprehensible and extremely idiotic to say da least. See for yourself, and no, these are not photo-shopped. 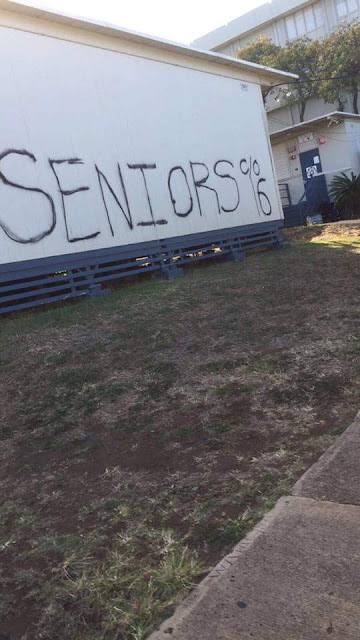 As an alumnus of Moanalua High School, I couldn't believe it was MY school. At first thought I was thinking (hoping) it was a rival school or something li'dat but nevah one of our own. 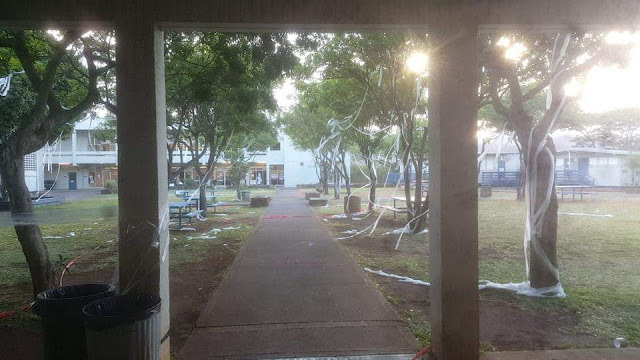 It's not dat it would make it easier to deal with but who would evah think dat someone would evah do anything back to their own high school - disgruntled or not - especially in Hawai'i wea we are all tied by it. Our high school connections are second nature hea so WTF was going through their minds? Pranks are made to be temporary and totally in fun. It does get 'competitive' to bettah da next prank but still, dis was not only distasteful, it was down right cruel. Is dat how you really wanted to be remembered - da punks who basically shamed their entire class? My sincerest gratitude goes out to da staff - and any volunteer - at Moanalua doing their best to quickly have da grounds cleaned up and ready for a special night come Friday. Thank goodness da 12 students were caught and will not participate in graduation! I hope those who know who these people remind them of their foolish acts for years to come. Life will go on, buildings will be repainted and da grounds will back in shape. Disgusted now but our pride will nevah be diminished - da spirit of Na Menehune will forevah be strong.